The Indiana State University Foundation today announced the winner of a contest to name a new sculpture to be erected outside the foundation's offices at 30 N. Fifth St.
Tyler Miller, an ISU freshman from Elkhart, submitted the winning name, "Renewal." The name was chosen from more than 100 entries submitted by Indiana State students and alumni, as well as Wabash Valley residents. "It was important that the title for the art was meaningful and overtly Indiana State," ISU Foundation president Gene Crume said. "Renewal is this name, as it will be a nice complement to people's experience at the sculpture." The sculpture, by Tim Upham of Fort Collins, Colo., will be made of white steel and blue glass marbles and situated outside of the ISU Foundation building. It will be complete by the beginning of November. "...It looks like a wave folding over. This symbolizes a generation of Sycamores graduating, and a new wave taking their place, 'renewing' Sycamore pride," Miller said in his submission statement. In addition to a renewal of the student body each year, the sculpture symbolizes the opportunity for the fresh start education offers, Miller said. "College itself is a chance for one to renew themself, so to speak. If you made a mistake in high school or in the real world, college gives you that chance to make up for it by bettering yourself and furthering your education and experience," he added. For his winning entry, Miller received an ISU Homecoming VIP package, which includes ISU apparel, a Barnes and Noble gift card and tickets to the VIP area of Memorial Stadium for Saturday's Homecoming football game. The ISU Foundation and Art Spaces will host a dedication ceremony for the sculpture on November 4 at 3 p.m.
Photo: http://isuphoto.smugmug.com/photos/i-WdW7TdD/0/D/i-WdW7TdD-D.jpg - An artist's rendering of "Renewal," a sculpture to be erected outside the Indiana State University Foundation offices at 20 N. Fifth St. in Terre Haute. 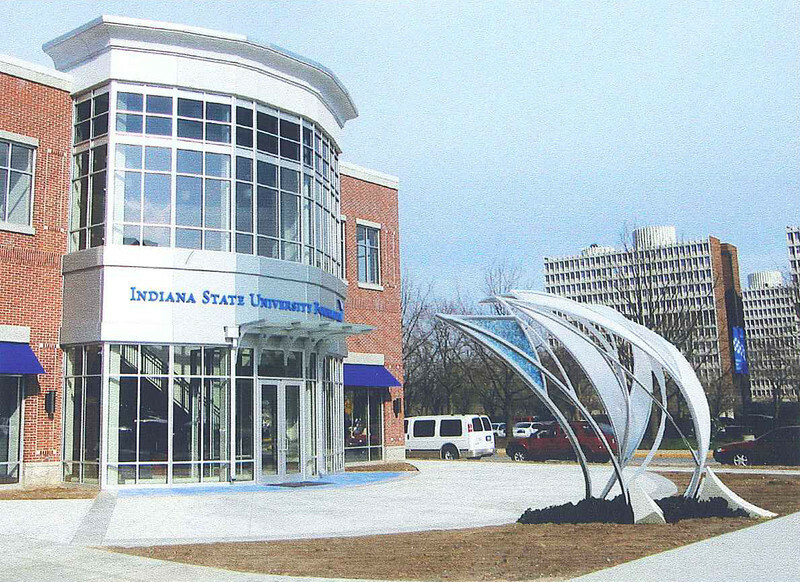 'Renewal,' a name proposed by Tyler Miller, an ISU freshman from Elkhart, has been selected as the name for a new sculpture to be erected outside the downtown Terre Haute offices of the ISU Foundation.